EPM are committed to reducing their environmental impact by implementing renewal energy and recycling initiatives. In all aspects of Quality, Health, Safety and Environment EPM operates under our own formal policies to ensure we meet statutory obligations, exceed stakeholder requirements and strive for continuous improvement. In 2013 EPM invested in the installation of 118 solar panels as a primary move to reduce our carbon footprint and further reduce operational costs. 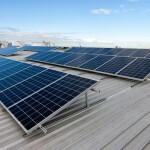 The system comprises 118 x 255W Q-Cells Mono-Crystalline Solar Modules and 2 x SMA 15000TL inverters. It is expected to produce approximately 55,000 kW of electricity per annum. In the first year alone, this is the equivalent of 53.5 tonnes of CO2 which would usually cost $18,500 using mains power. In 2010 EPM invested in a swarf crusher machine, and later in 2011 engineered further modifications to improve its safety and reduce the environmental impact. Its innovative design filters 99.8% of oil and coolant from the scrap material before it is recycled. 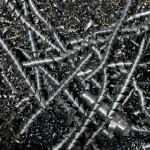 These recycled fluids are then reused in machinery within EPM. EPM continually strive to improve the industrious performance of the swarf crusher to handle heavier loads and a diverse range of materials. 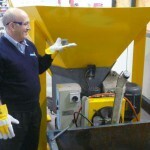 The swarf crusher is designed to compact shavings of steel, aluminium, and bronze into manageable swarf biscuits to enable safer and more effective handling for further recycling.